In hockey, it’s called being caught shorthanded. Outnumbered on a 3-on-2 or 2-on-1 rush, or down a player due to a penalty, it’s never fun to compete without an appropriate amount of resources. In Las Vegas this winter the NHL’s newest team, the Vegas Golden Knights, found themselves somewhat shorthanded on the wireless side of things when the Wi-Fi network in their castle — a building also known as T-Mobile Arena — couldn’t quite keep up with the demand generated by the Knights’ smashing debut. 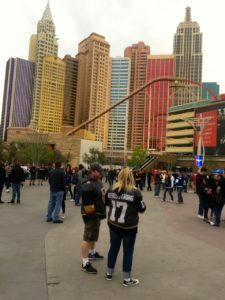 But by deploying a classic Vegas strategy — going “all in” with a quick network upgrade that added nearly 200 access points — The Knights, T-Mobile Arena and connectivity partner Cox Business brought the Wi-Fi in line with the team’s first-place level of play, ensuring that fans will be able to share whatever happens in Vegas during the upcoming playoff run on a high-density network that reaches from the rink to the roof, as well as outside the arena. 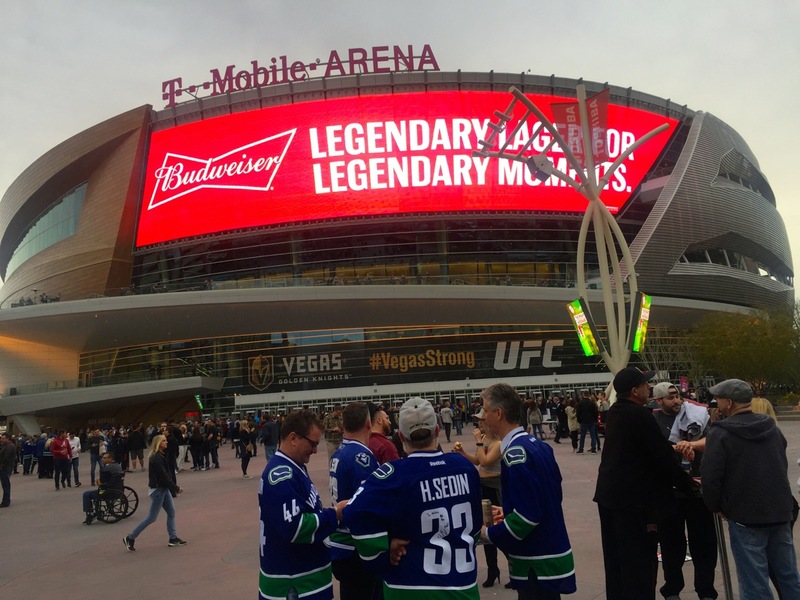 Visiting team fans also have made T-Mobile Arena a popular NHL spot this season. 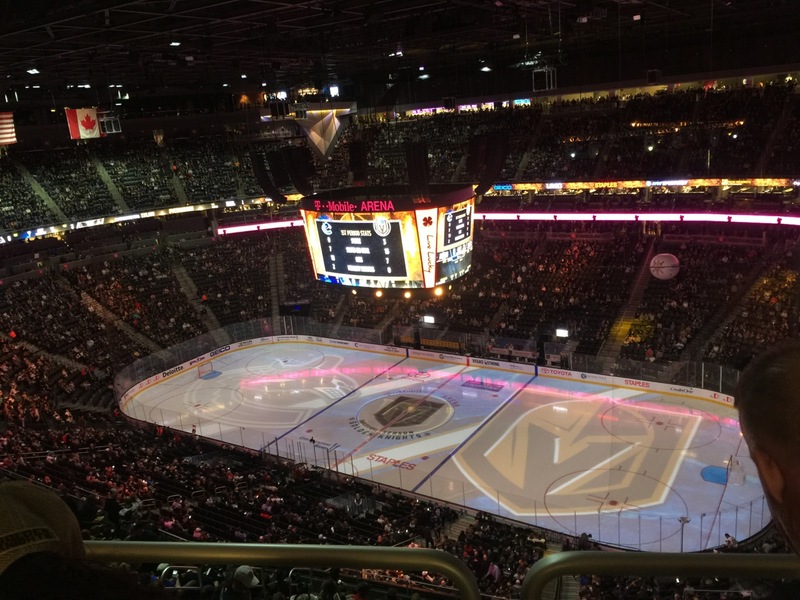 While the building itself has been open now for nearly 2 years, its original accelerated construction time frame and the uncertainty of the NHL bid meant that network deployments inside T-Mobile Arena were always going to have some wait and see attached. 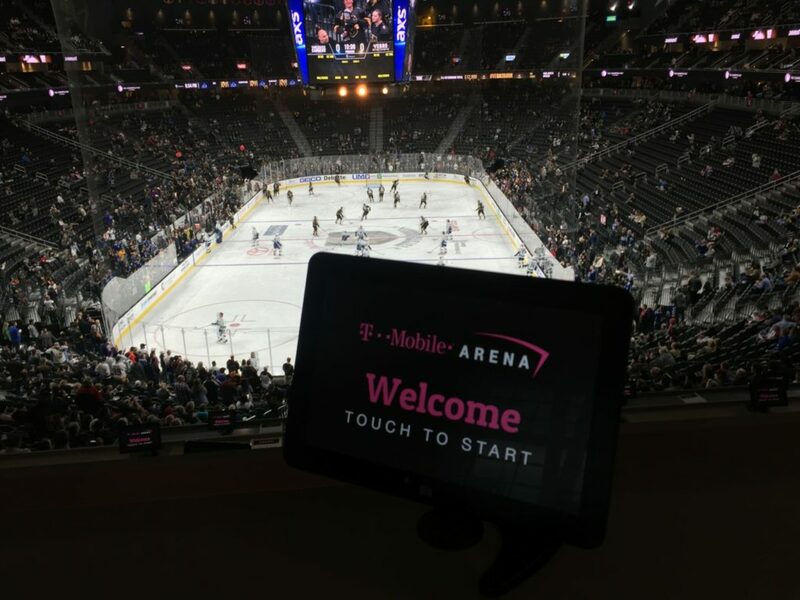 “The original network design was kind of a best guess,” said Vikrant Bodalia, director of technology operations for MGM Resorts International (which co-owns T-Mobile Arena in a joint venture with the Anschutz Entertainment Group), during an interview and tour of the stadium the day after MSR attended a Knights game during the regular season. When the arena opened there were approximately 520-plus Cisco Wi-Fi APs throughout the building, but according to Bodalia there were only about 66 of those in the lower seating bowl. While there were some that were mounted under seats, those APs were few in number and mainly in the lowest rows, where Bodalia said performance was weakened by interference from fans’ bodies. In between the time when T-Mobile Arena opened its doors in April of 2016 and the start of the current NHL season, every event was different from the next one, meaning that new fans filled the arena each time. The high percentage of “transient” crowds, Bodalia said, made it hard to get good feedback on how the Wi-Fi network was performing. 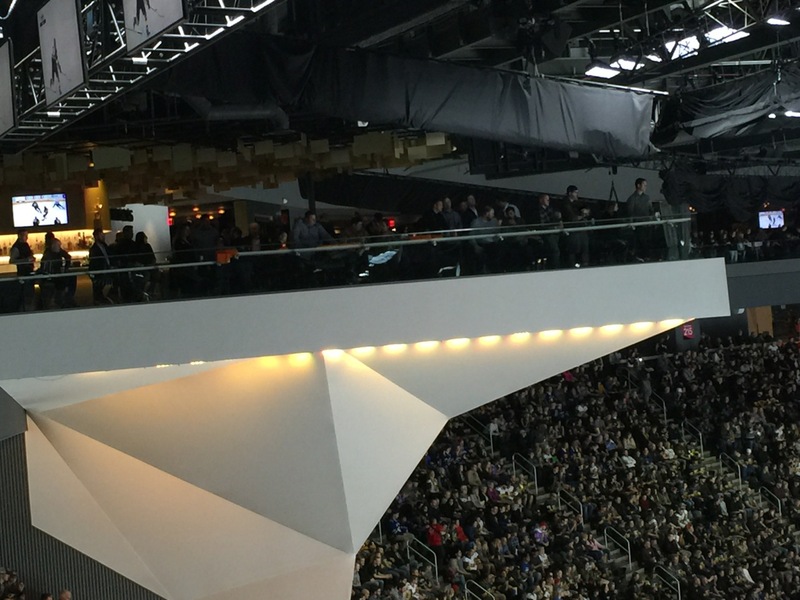 Cisco Wi-Fi APs in custom enclosures designed by Cox Business ring the overhangs above the main seating bowl. Once the Golden Knights started playing, however, fan feedback was “very vocal and very good,” Bodalia said. Though it was always expected that there would be some rush in popularity for an expansion team, the surge in season ticket sales (team officials said attendance is more than 75 percent season ticket holders) is probably at the high end of expectations. Add in to that the appeal for visiting teams’ fans to spend time in Vegas, along with the completely unexpected division-leading on-ice performance, and you have a sort of perfect storm that pushed bandwidth demands early on. 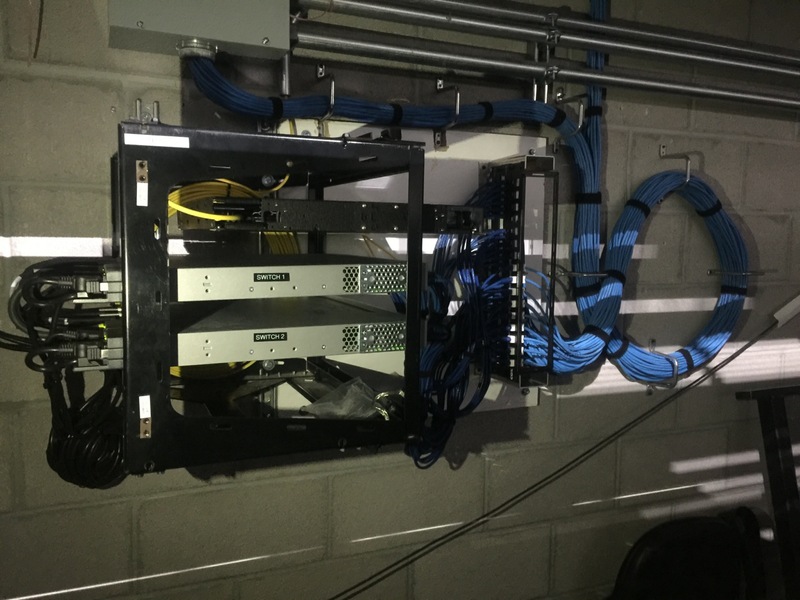 For Bodalia and his IT team it was game on, with a quick research project into the best way to add more capacity, followed by an all-hours plan to get the job done. 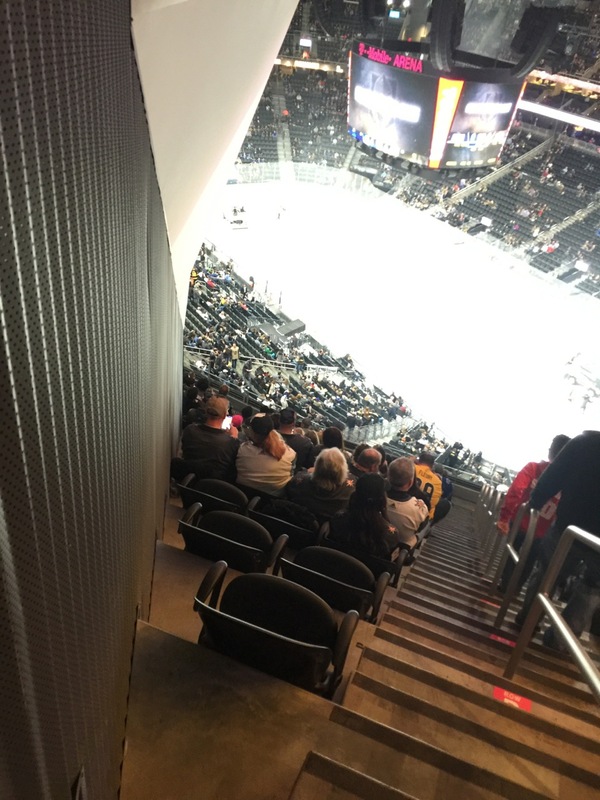 One technique that has worked well in other stadiums — putting Wi-Fi APs into handrail enclosures — didn’t work at T-Mobile Arena mainly because the height of the railings was too low. A few test deployments didn’t produce the desired performance, Bodalia said, so that path was rejected. Instead, the team of Cox Business, T-Mobile Arena and Bodalia’s MGM squad settled on a plan to deploy under-seat Wi-Fi APs, a deployment with a split degree of difficulty since about half the lower-bowl seats are on a retractable metal infrastructure to allow for customizable seating arrangements. For the APs placed under concrete-mounted seats, Bodalia’s team devised a method of deployment that did not require them to drill through the concrete for each placement. Instead, the APs used low-profile conduit that stretched beneath the seats to the walkways, where connections could be consolidated. 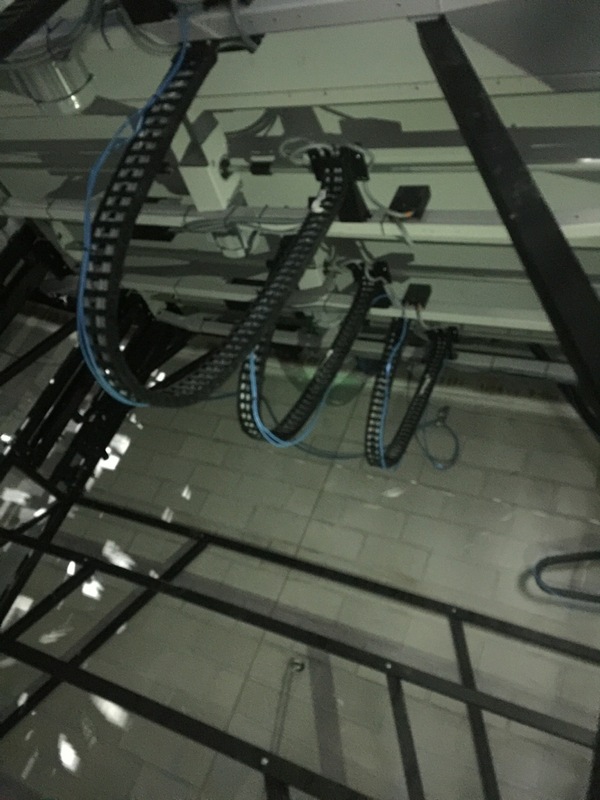 The T-Mobile Arena crew even tucked some of the wiring underneath rubber gaskets between concrete partitions, a method also used at Notre Dame Stadium to get cabling to APs without going through the concrete. 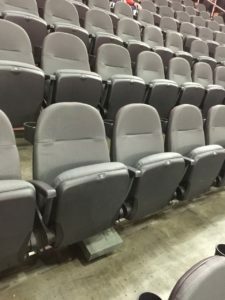 For the APs located on movable stands, Bodalia said the key was to find a method that didn’t disrupt the sometimes daily need to move the seats back and forth to comply with the venue’s busy schedule of concerts and events other than Knights games. What they ended up with was a design that included multiple switch-mounting sites on the walls underneath the backs of the stands, and then flexible “caterpillar” tracks to host cables, which would curl up or stretch out as needed, without having to detatch cables while physically moving the stands. At project’s end, there are now 200-plus APs in the main lower seating bowl, more than triple the initial deployment. 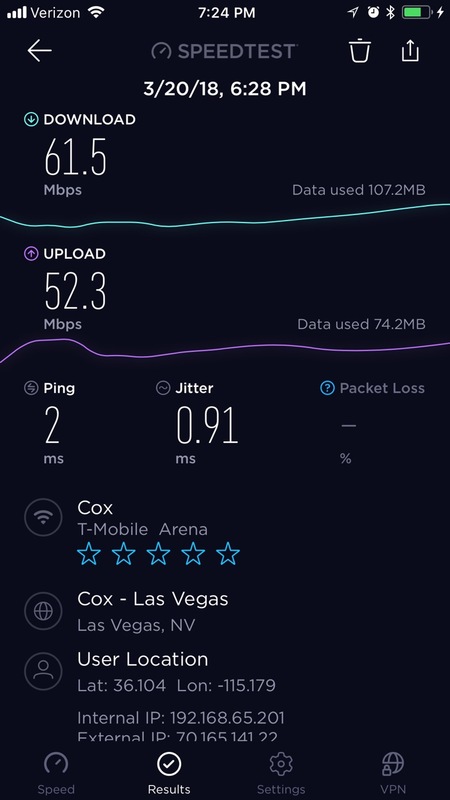 One of the many solid Wi-Fi speed tests we took in T-Mobile Arena. 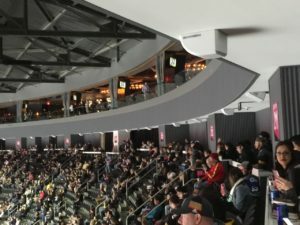 What was surprising upon arriving at the venue was the relative “maturity” of the fan base — while some had predicted that visiting fans would overwhelm the locals this season, instead the opposite is true, with families, couples and packs of Knights fans flooding the zone outside T-Mobile. 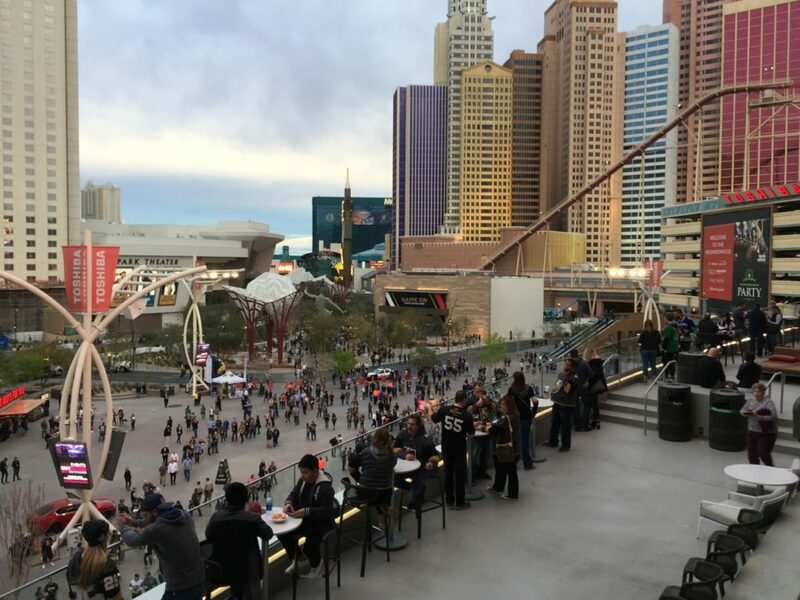 In a well-thought arrangement, the surrounding area between the New York, New York, the Monte Carlo and T-Mobile Arena is an already successful “fan zone” with open spaces for games and portable concession stands, and several watering holes filled to the brim an hour before game time. After clicking a single box on a splash screen to accept terms for the Wi-Fi service, we got speed results of 42.4 Mbps on the download and 33.7 Mbps on the upload standing in the middle of the plaza outside the main gates as fans flowed by. Switching to cellular, we got a reading of 16.2 Mbps/9.25 Mbps at the same spot on the Verizon network. 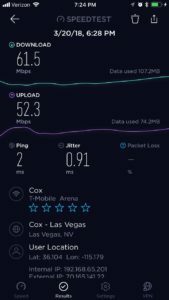 According to T-Mobile Arena, there is a neutral host DAS in and around the venue that supports all four of the top carriers. Inside the arena, we went right down to the lower bowl to find and test some of the new under seat APs, and got a mark of 56.5 Mbps/54.7 Mbps in Row J of Section 17, in line with a face-off circle near one of the goal lines. Moving up we got a test of 61.5 Mbps/52.3 Mbps in a packed-house Bud Light Club on the main concourse and a 56.2 Mbps/50.3 Mbps mark in the Goose Island club, which serves the suite level on the third floor. We couldn’t get inside either of the two “sky lounges” or the Hyde Park club on the arena’s top levels since they had private parties that night, but we did find the lonliest seat in the arena — a single-seat row in section 209, at the highest regular-seating apex. 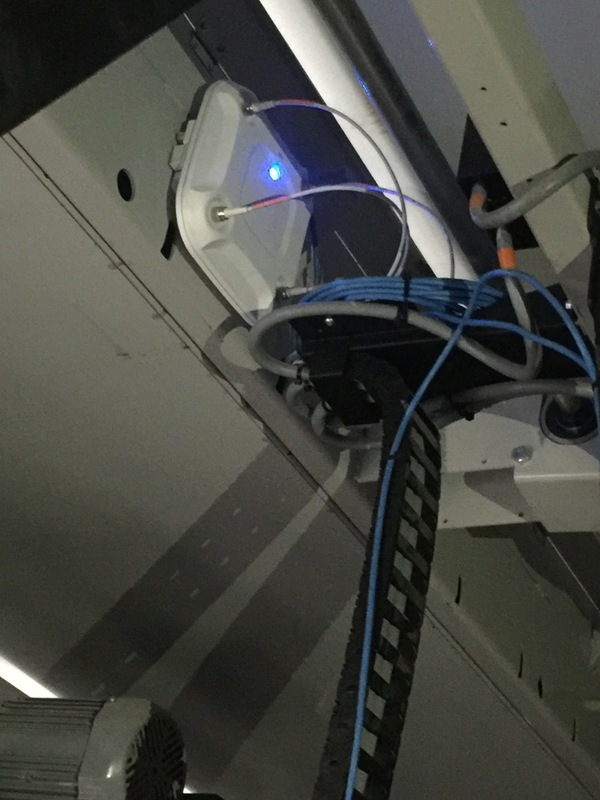 Even with the challenging RF and tight spaces we still got a Wi-Fi reading of 21.8 Mbps/22.4 Mbps, showing that Bodalia’s team didn’t ignore the hard places. It was fun to watch the Golden Knights’ Vegas-style pregame ceremony, which includes a fun “pulling the sword from the stone” routine to help fire up the fans. But the very vocal Vegas contingent — watch out for their clever coordinated shout during a certain part of the national anthem — doesn’t appear to need much help, as there is an infectious enthusiasm pervading the building, one that you might not expect from such a non-traditional “hockey town” as Las Vegas. On one level, the team is a perfect antidote for the local pain caused by the mass shooting outside the Mandalay Bay last fall; many fans sported Knights jerseys with “Vegas Strong” written across the top of the back, and there is a very classy segment during the evening where a “Vegas Strong Hero” gets honored. The night we attended the “hero” was a nurse who stayed on duty that dark night helping to save many lives; she was honored with a standing ovation. 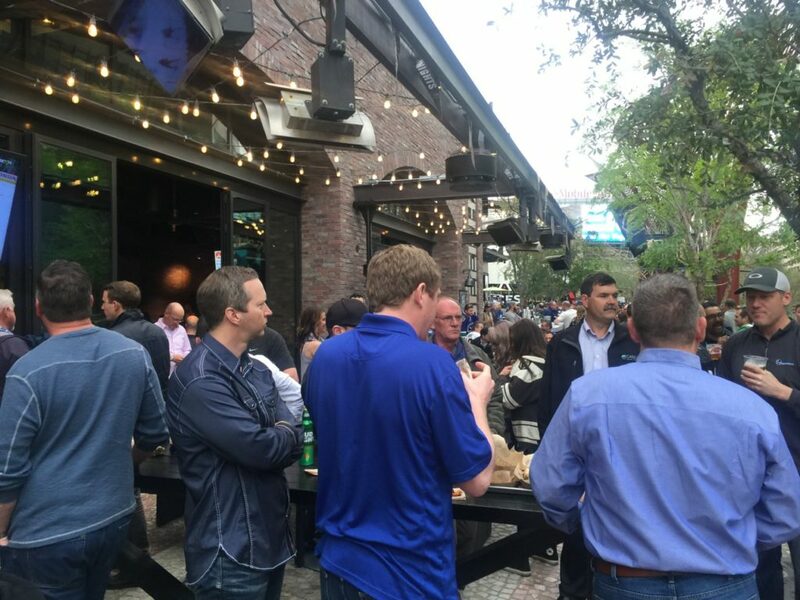 But now, following the Knights’ first-round sweep of the Los Angeles Kings in the playoffs, you can add Stanley Cup excitement to the mix, adding to the network pressure as fans will want to connect and share more. The good news is, thanks to the recent upgrades there is now a Wi-Fi network to match the team’s performance, no matter how far they advance.